This work in progress is an effort to make a recognizable model of my campus church. I'm scaling it to the work for the chicklet people, so I can have some movement through it, etc. 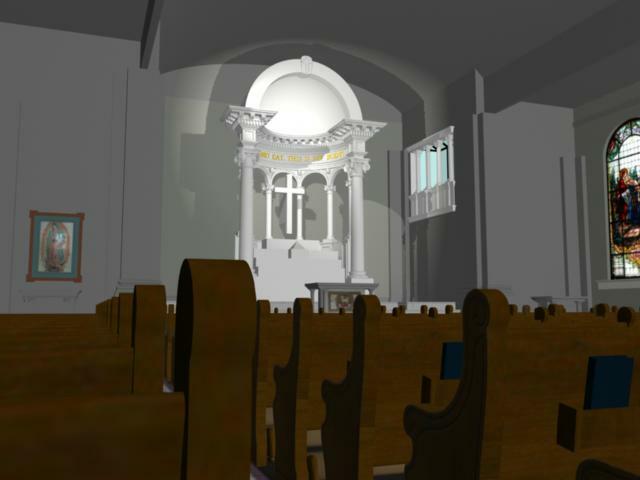 9/2004 - This model is almost complete, I just need to finish the choir loft so I can show the back of the church. I've stalled long enough in finishing my model that they've renovated the church! They uncovered two stained-glass windows that are behind the sancutuary on either side of the Cupola (the white part). I'll have to break out the camera again and inset those into the model now, too.